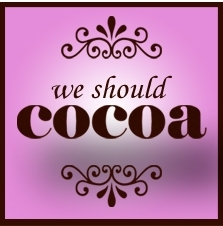 This month's We Should Cocoa challenge is hosted by Lucy at The KitchenMaid, and the aim is to create a recipe that uses coffee and chocolate. I definitely knew I wanted to make a cake for this, but couldn't decide on the icing until the last minute. Would it be chocolate icing or coffee? I decided, in the end that it would be neither: either flavour would tip the balance of the flavour of the actual cake. So I went with one that works well with both coffee and chocolate: vanilla. I think it's actually quite difficult to make a cake with chocolate and coffee and have it so that you can taste both. I often add some coffee to my chocolate cakes, which gives it a richer flavour, but doesn't ever taste of 'coffee'. And a spoonful of cocoa added to a coffee cake makes it taste richer, but doesn't necessarily give it a 'chocolatey' flavour. But with this cake, you do taste both flavours - the sweet, husky cocoa and the roasty richness of coffee. The thin layers of vanilla buttercream just add a soft sweetness and a final dusting of espresso powder over the top gives it an extra burst of flavour as well as the appearance of a milky, cocoa-dusted cappuccino. Mix all of the cake ingredients in a large bowl, except the boiling water and coffee granules. Stir well, until smooth. Gradually pour the coffee mixture into the mixture and give it a good stir, to comine. Pour into a deep 25cm round cake tin and bake for 40-45 minutes at 180°C, until a skewer poked through the cake emerges clean. Leave to cool completely. Cut through the cake, horizontally. Make up the buttercream by mixing the butter and icing sugar together, along with the vanilla essence. Spread about one third of the mixture onto one half of the cake and sandwich the two pieces together. For a really neat result, freeze the cake for 15-20 minutes. This will stop crumbs coming loose while you ice, although to be honest I did skip this part. Once you've sandwiched the two halves together, spread the rest of the buttercream over the top and sides of the cake, smoothing it down as you go with a flat knife. Finish by sprinkling the espresso powder over the top, which gives it the appearance of a milky cappuccino dusted with cocoa - and also adds an extra burst of coffee flavour. I'd eat a slice! This looks delicious! Love the idea of dusting with cocoa powder on top, sheer genius. Eat a slice? Someone would have to restrain me from eating more than just a slice. It looks fantastic and I love the flavour combinations. Fab coffee shop cake - I would eat more than one slice! Would I eat a slice? Is there any sand in the Sahara? Of course! It does look really inviting. I agree about the difficulty of tasting both coffee and chocolate in cakes, though - it's a delicate balance. I think I'll go and get a cappuccino.